The Flying Sanctuary is an ancient temple floating high above the clouds. The temple is built on a group of floating islands and it’s told to have the spirit of an immortal oracle bound into a golden animated statue. The old tales tell that the Golden Oracle can tell the future and look into any living creatures soul. The monastery was abandoned ages ago and is now guarded by the construct monks serving the oracle. The Flying Sanctuary was invaded by the storm pirates and the monks fled the monastery. They are trying to find someone to fight the storm pirates and save the Golden Oracle before it’s too late. The Golden Oracle has foreseen a great evil approaching. It sends one of its clockwork pigeons to find the characters. When the characters arrive to the monastery it seems abandoned, but the Golden Oracle has laid out various traps, puzzles and adversaries to challenge and test the adventurers before they can meet the oracle. The adventurer’s hear about this mysterious flying temple from an old airship sailor in a tavern. They are told that the temple still holds great treasure and the sailor is willing to guide the adventurers to the temple, if they get their share of the loot. 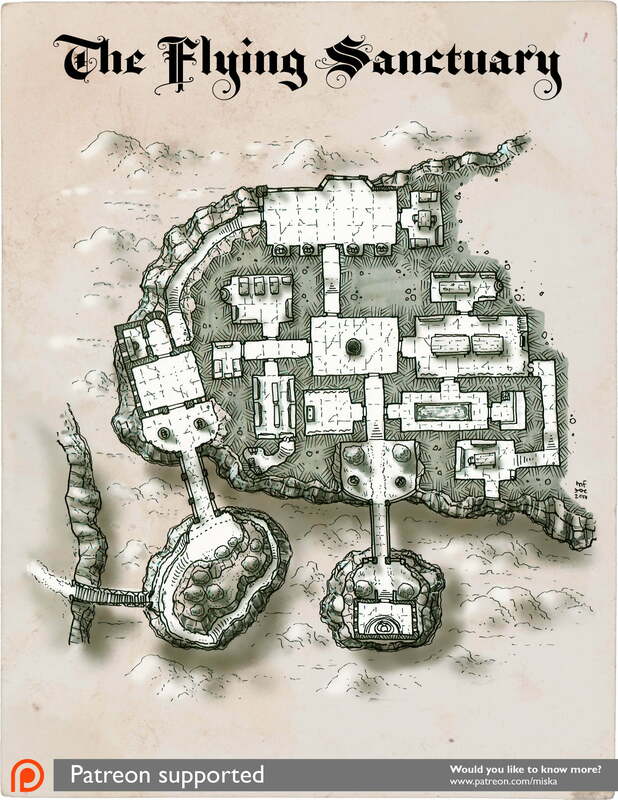 And as a note, of course this map can be set on a high mountain top instead of a floating island if it suits your setting better.